Our department is striving to produce a generation that is fit not only physically and mentally but also morally, emotionally and socially through various games & sports such as football, basketball, volleyball, athletics and gymnastics. With the very committed and well qualified staff Mr. Christopher Chandra, Mr. Alan Moses, Mr. Joshua, Ms. Liza Hernandez, Ms. Shermil Fredita and Ms. Aevelyn Maria Jean, we continue to achieve our theme “Sound mind in sound body”. Special training and coaching are provided for the talented students. After the training, probables are selected for the school teams. 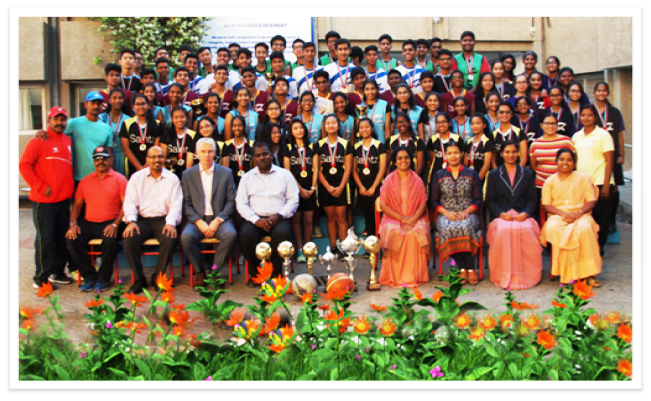 Under the coaching and guidance of our teachers, our teams have participated in various inter-school tournaments and championships and have won many laurels.